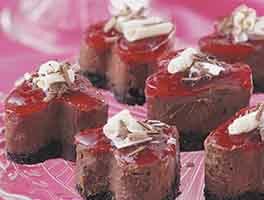 These mini chocolate cheesecakes, with their crisp cookie crust, creamy filling, and caramel-nut topping, will be the centerpiece of your dessert buffet. Preheat the oven to 350°F. Have ready a 12-well round or heart-shaped pan. Each well should be 1 1/2" to 2" across. To make the crust: Mix all of the crust ingredients. Place a tablespoon of crumbs in each cup of the pan, pressing into the bottom and about 1/4" up the sides. Bake for 10 minutes, remove from the oven, and cool slightly. Reduce the oven temperature to 275°F. To make the filling: Beat the cream cheese until soft and fluffy. Mix in the sweetened condensed milk. Stir in the melted chocolate, vanilla, and egg. Use about 2 heaping tablespoon cookie scoops to fill each cup about 3/4 full. 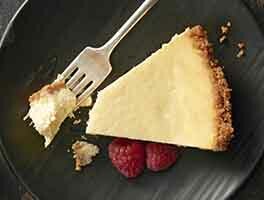 Bake for 35 minutes, until the cheesecake is set around the edges — a small spot in the middle should still look soft. Remove from the oven and cool slowly to room temperature. To make the glaze: Place the glaze ingredients in a small saucepan over low heat, or put the ingredients in a microwave-safe bowl and microwave at low power. Heat, stirring often, until the chocolate has melted and the mixture is smooth. Cool, stirring occasionally, for 10 to 15 minutes, so that the glaze thickens slightly but is still pourable. 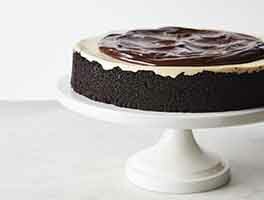 Pour about 1 tablespoon of chocolate glaze onto each cheesecake, tilting the pan to cover completely. Chill the cheesecakes before removing them from the pan. 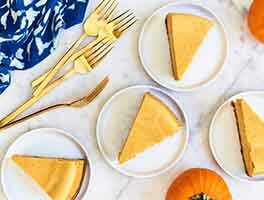 To make the topping: Place caramel and cream in a small saucepan and warm over low heat, or put the ingredients in a microwave-safe bowl and microwave at low power. Stir frequently, until melted and smooth. 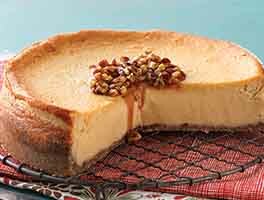 Just before serving, drizzle cheesecakes with melted caramel and sprinkle with toasted nuts. Store, covered, in the fridge for up to 3 days. Freeze (before adding caramel to the top) for up to a month. 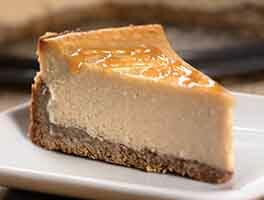 You can adjust the consistency by adding more cream to thin the caramel topping, or by chilling slightly to thicken. Decadent! The layers of this cake were each fairly easy to make - not a lot of time for each layer. And the result is the most delicious cake I have EVER tasted. Fabulous! These are pure delight and always a big hit when I make them. The last time was for my Goddaughter's confirmation party - her grandparents (who usually don't like anything) liked them so much I thought they were going to lick the platter they were served on. My Goddaughter has requested them again for her birthday. The preparation is fairly easy - though now I make them a day ahead and pop the chilled cheesecakes out before putting the chocolate topping on because the first couple of times I had trouble getting the topped ones out of the pan. I really liked this one!!! This recipe has a couple step to it but it was worth it. My Husband who doesn't generally go for chocolate things like it also and asked for it again. I didn't make the carmel syrup when I made it because I didn't think it needed it. My wife isn't a chocoholic so one was enough for her, but I took some to my neighbor who is -- smile from ear to ear! I had problems releasing these chilled cheese cakes (as in they wouldn't release and I had to spoon them out), but I had used my popover tray. Heart shaped pans are on the way. Are there any tricks to releasing these treats? I wish I had used my Everbake Pan Spray. These are wonderful. I made them & took them to work when I first got my mini cheesecake pan. My coworkers loved them & dubbed them Orgasmic cheesecakes. I am making them again for a coworkers birthday, at her request.